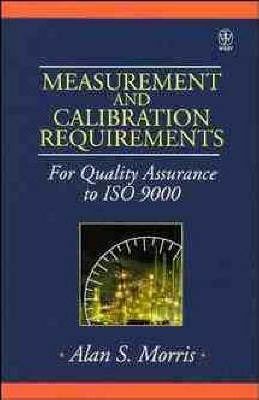 Measurement and Calibration Requirements For Quality Assurance to ISO 9000 Alan S. Morris University of Sheffield, UK Quality assurance is of paramount importance for today's businesses. This uniquely integrated approach to quality management focuses on the measurement and calibration requirements that are key to the achievement of ISO 9000. The cross-disciplinary approach makes this well-structured text an invaluable asset both to engineers concerned with the development, implementation and maintenance of quality systems and to managers wishing to gain an insight into quality assurance issues. Quality Systems in Manufacturing and Service Provision. Calibration Procedures. Instrument Classification, Characteristics and Choice. Sources of Measurement Error. Transmission and Processing of Measurement Signals. Measurement Signal Recording and Data Presentation. Practical Implementation of Measurement and Calibration Procedures. Reliability in Manufacturing Systems. Software Quality Metrics. Statistical Process Control. Product Sampling and Testing. Temperature Calibration. Pressure Calibration. Mass, Force and Torque Calibration. Dimension Calibration. Volume Flow Rate Calibration. Calibration of Miscellaneous Parameters. Appendices. Index.